Well the Missus and I trundled down to the Big Town last weekend to catch one thing and another and say, it was swell. First, of course, there was crosstown traffic, which takes roughly 30 minutes to navigate. 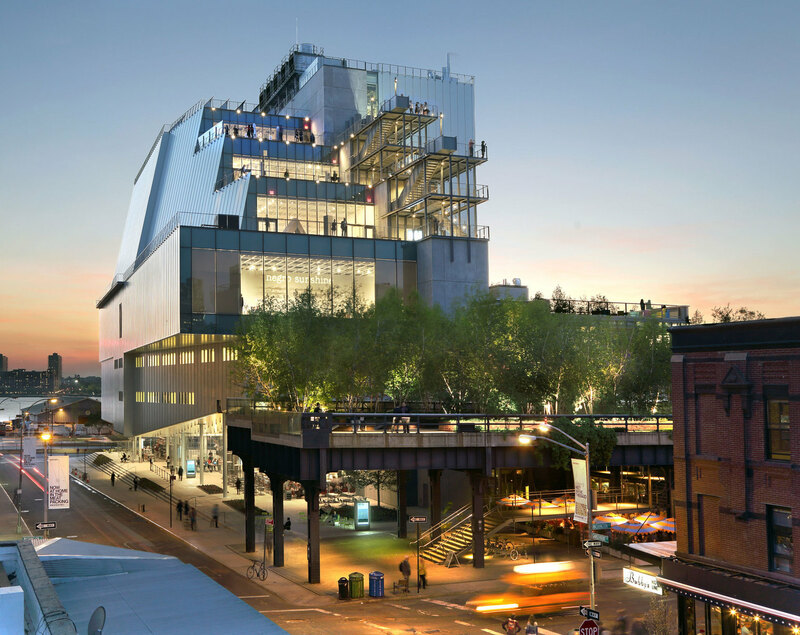 From there we moseyed down to the new Whitney Museum to take in America Is Hard to See and found it . . . hard to find (we missed our left turn). But eventually we stumbled upon the New Palace of American Art with its razzle-dazzle exterior. Inside, we found a bright, airy environment, quite different from the old Marcel Breuer Whitney on Madison Ave. We also found the showcase exhibit. That’s true. 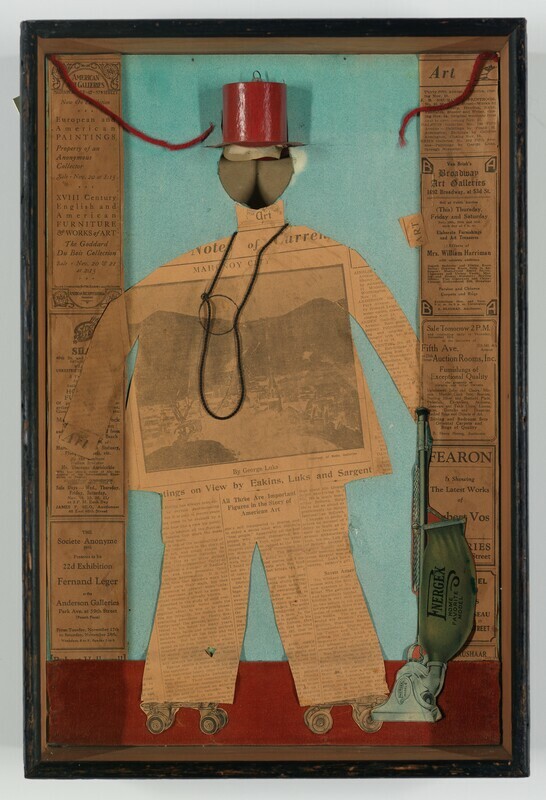 Who woulda thunk this piece was created by Arthur Dove? 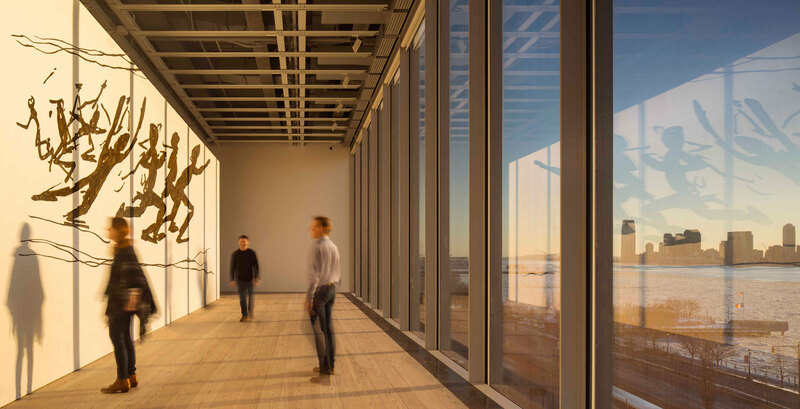 Beyond the contents of the exhibit, though, the new Whitney has become a sort of Fine Arts Rorschach Test. Here’s an art critic – Jerry Saltz of New York magazine – who loves the new Whitney. And here’s a critic – James Gardner in The Weekly Standard – who really doesn’t. 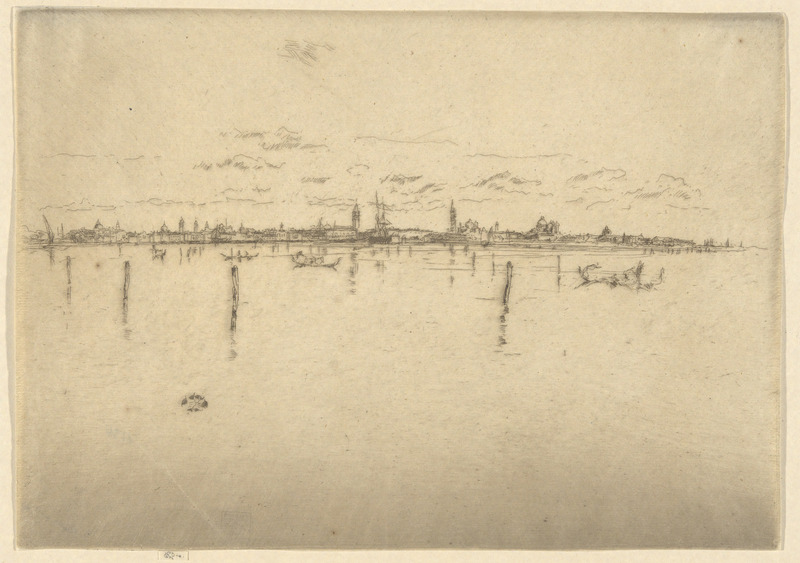 The new digs are fine – a nice enough place to view the Whitney’s absolutely stunning collection. The views from the outdoor decks are . . . panoramic. And the sculptures on the decks are . . . pleasant. But all the bells and whistles? And the overpriced cafes? We don’t care much. Today is Celebrity Artist Day! The still above is from Ono’s 1965 Cut Piece, filmed by Albert Maysles + David Maysles at Carnegie Hall. 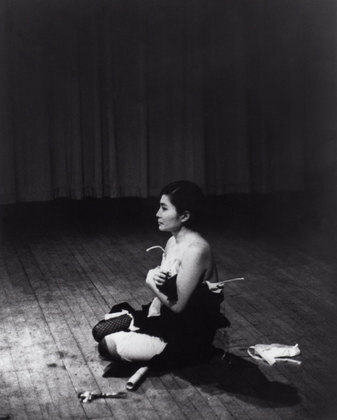 To be honest, I’m not really smart enough to get all of what Yoko Ono was doing back then, but I get that she was breaking through something or other. As for the exhibit (through September 7), some of it is fun to look at and some of it less so. But worth seeing. We thence hied ourselves to another celebrity MoMA exhibit, Andy Warhol: Campbell’s Soup Cans and Other Works, 1953–1967. 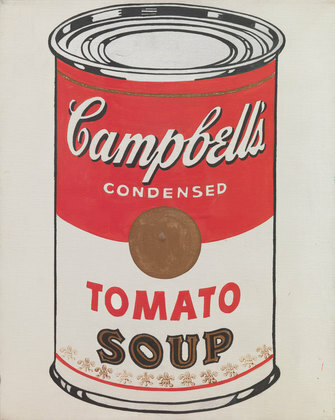 Andy Warhol’s Campbell’s Soup Cans is the signature work in the artist’s career and a landmark in MoMA’s collection. The 1962 series of 32 paintings is the centerpiece in this focused collection exhibition of Warhol’s work during the crucial years between 1953 and 1967. The Soup Cans mark a breakthrough for Warhol, when he began to apply his seminal strategies of serial repetition and reproduction to key subjects derived from American commodity culture. Warhol also developed his signature use of the flat, uniform aesthetic of photo-screenprinting just after he completed the Soup Cans. For the first time at MoMA, the 32 Soup Cans are shown in a line (rather than a grid), echoing the way they were first exhibited at the Ferus Gallery, Los Angeles, in 1962. The exhibition also includes drawings and illustrated books Warhol made in the 1950s, when he started his career as a commercial artist, and other paintings and prints from the 1960s, when he became a beacon of the Pop art movement. As if you even care. Through October 18. Actually, the real winner at MoMA right now is From Bauhaus to Buenos Aires: Grete Stern and Horacio Coppola. 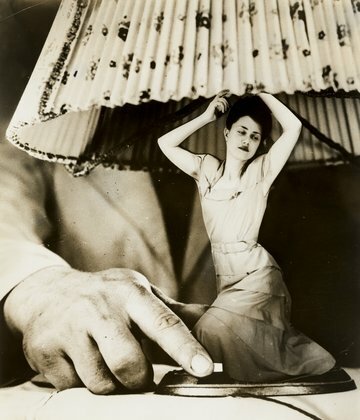 From Bauhaus to Buenos Aires: Grete Stern and Horacio Coppola is the first major exhibition to focus on the German-born Grete Stern and the Argentinean Horacio Coppola, two leading figures of avant-garde photography who established themselves on both sides of the Atlantic. The exhibition begins in the late 1920s with each artist’s initial forays into photography and typographic design. In Berlin in 1927, Stern began taking private classes with Walter Peterhans, who was soon to become head of photography at the Bauhaus. 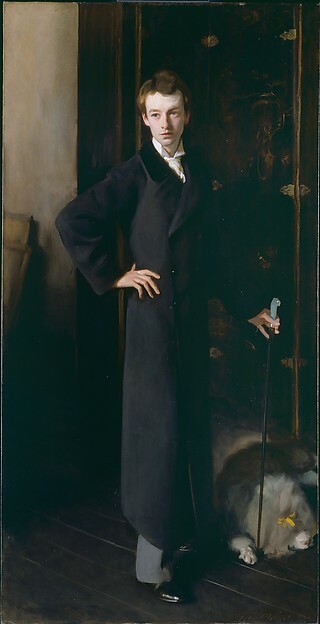 A year later, in Peterhans’s studio, she met Ellen (Rosenberg) Auerbach, with whom she opened a pioneering studio specializing in portraiture and advertising. Named after their childhood nicknames, the studio ringl + pit embraced both commercial and avant-garde loyalties, creating proto-feminist works. In Buenos Aires during the same period, Coppola initiated his photographic experimentations, exploring his surroundings and contributing to the discourse on modernist practices across media in local cultural magazines. In 1929 he founded the Buenos Aires Film Club to introduce the most innovative foreign films to Argentine audiences. His early works show the burgeoning interest in new modes of photographic expression that led him to the Bauhaus in 1932, where he met Stern and they began their joint history. It’s a knockout, through October 4. From there we headed to the New York Public Library for the Performing Arts (at Lincoln Center) for Sinatra: An American Icon (through September 4). 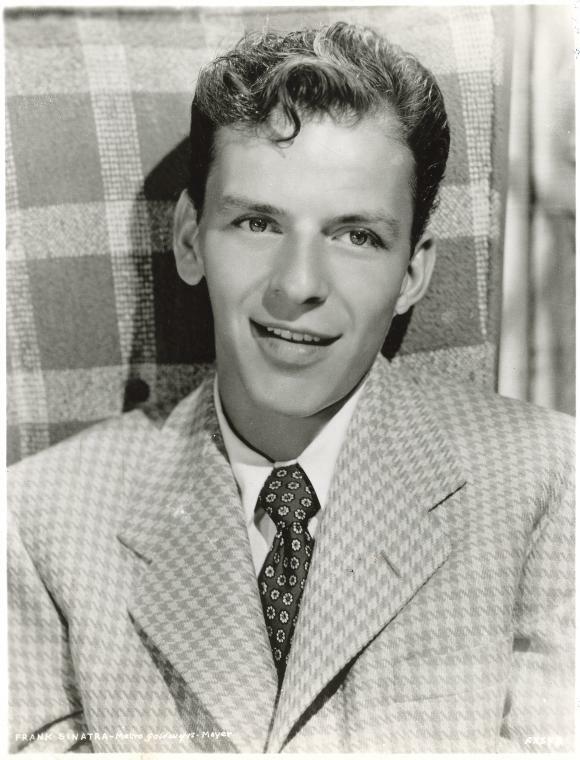 Frank Sinatra is a singer who comes along once in a lifetime, but why did he have to come in mine? The Sinatra: An American Icon exhibition has many wonderful media stations for visitors—songs, excerpts from television specials, films trailers and featurettes, and a juke box. But the one that is garnering the most attention is “The House I Live In,” the RKO short film that won Sinatra his first Oscar. The NYPL show completed our Sinatra hat trick this past month: exhibit, HBO documentary All Or Nothing At All, and Gay Talese’s classic profile Frank Sinatra Has a Cold. 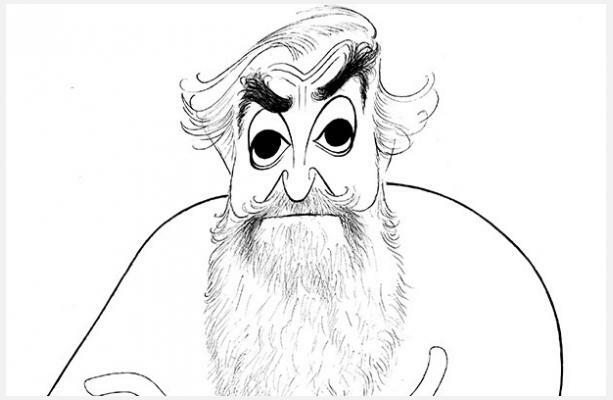 Next stop: The New-York Historical Society to catch The Hirschfeld Century: The Art of Al Hirschfeld (through October 12). 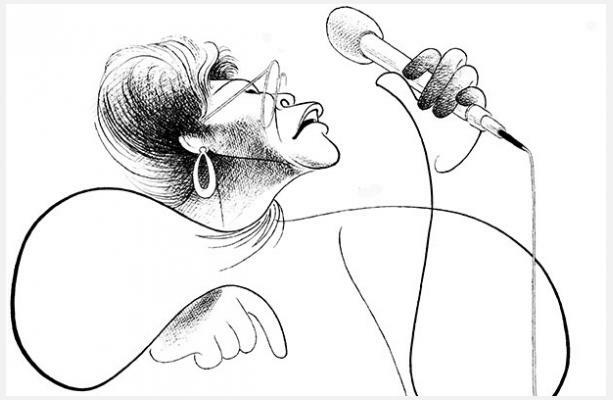 Al Hirschfeld (1903–2003) brought a distinct style to celebrity drawings, making his work instantly recognizable —to be “Hirschfelded” was a sign that a performer had arrived. Now for the first time, nine decades of Hirschfeld’s work will be on display at the New-York Historical Society in The Hirschfeld Century: The Art of Al Hirschfeld, a multimedia exhibition organized in partnership with The Al Hirschfeld Foundation and in conjunction with Alfred A. Knopf’s publication of curator David Leopold’s groundbreaking book on the artist. 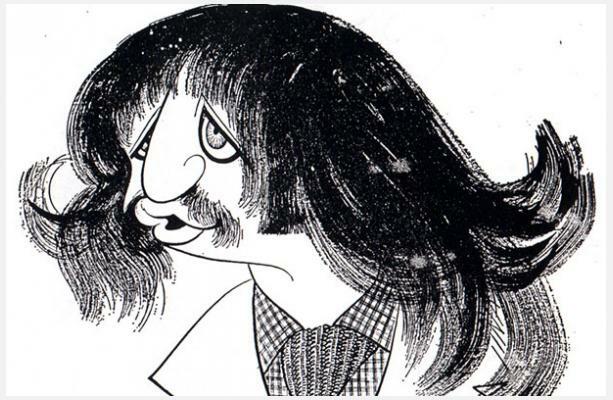 The exhibition of over 100 original works includes many highlights from Hirschfeld’s prolific career with a special emphasis on the New York Times—where he was a contributor for over seven decades. Now go count the Ninas. 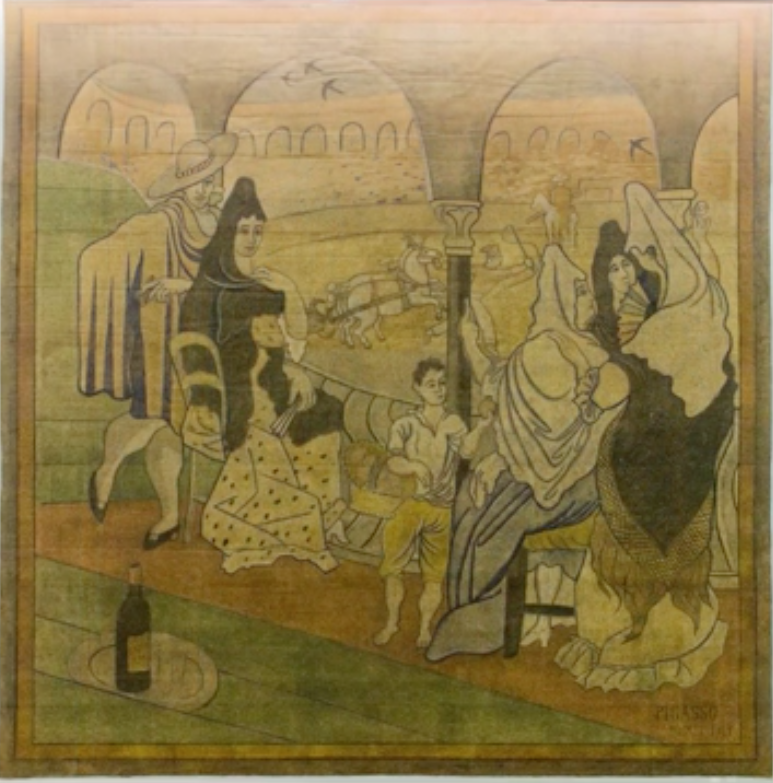 Before we left N-YHS, we swung by Picasso’s “Le Tricorne”. 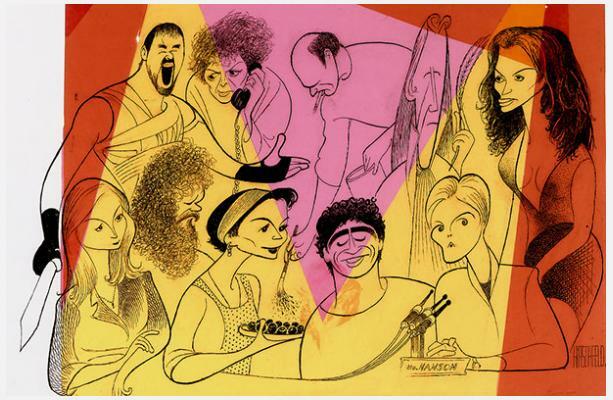 Then it was back to Lincoln Center for Shows for Days (through August 23), the new play by Douglas Carter Beane that stars the ever-fabulous Patti Lupone, accompanied by a terrific cast. You might have caught the rumpus the other week around LuPone’s snatching the cellphone from a woman who had been texting throughout the entire show. A theater legend is born. Start today at the too-often-neglected Museum of the City of New York and its exhibit Everything Is Design: The Work of Paul Rand (through October 13). Everything Is Design: The Work of Paul Rand features more than 150 advertisements, posters, corporate brochures, and books by this master of American design. It was Rand who most creatively brought European avant-garde art movements such as Cubism and Constructivism to graphic design in the United States. His philosophy, as expressed in his work and writings, including the recently republished 1947 Thoughts on Design, argued that visual language should integrate form and function. Born in Brooklyn in humble circumstances, Rand (1914-1996) launched his career in the 1930s with magazine cover design and, starting in the early 1940s, he worked as an art director on Madison Avenue, where he helped revolutionize the advertising profession. He later served as design consultant to leading corporations like IBM, ABC, UPS, and Steve Jobs’s NeXT, for whom he conceived comprehensive visual communications systems, ranging from packaging to building signage, all grounded in recognizable logos, many of which are still in use today. Illustrative video from Rand’s One Club Creative Hall of Fame 2007 induction. Fun fact to know and tell: Rand always presented just one concept. You want other solutions, he said, talk to other designers. Also at MCNY: a shiny Gilded New York (with a Tiffany & Co. tie-in), a cacophonous Folk City: New York and the Folk Music Revival, and the truly impressive Saving Place: 50 Years of New York City Landmarks. From there it was just ten blocks to the Jewish Museum for Revolution of the Eye: Modern Art and the Birth of American Television (through September 27). Revolution of the Eye: Modern Art and the Birth of American Television is the first exhibition to explore how avant-garde art influenced and shaped the look and content of network television in its formative years, from the late 1940s to the mid-1970s. During this period, the pioneers of American television—many of them young, Jewish, and aesthetically adventurous—had adopted modernism as a source of inspiration. Revolution of the Eye looks at how the dynamic new medium, in its risk-taking and aesthetic experimentation, paralleled and embraced cutting-edge art and design. It’s a terrific exhibit, ranging from Ernie Kovacs to Andy Warhol. How does an “exhibition to explore how avant-garde art influenced and shaped the look and content of network television in its formative years” not include Fractured Fairy Tales? We drifted down Fifth Avenue to the Neue Galerie where Gustav Klimt and Adele Bloch-Bauer: The Woman in Gold (through September 7) is doing land-office business. But we were just as captivated by Russian Modernism: Cross-Currents of German and Russian Art, 1907-1917 (through August 31). 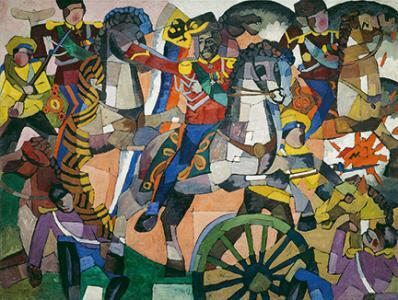 This is the first exhibition at an American museum to focus exclusively on the important artistic links between these two countries, featuring works by artists Natalia Goncharova, Erich Heckel, Alexei von Jawlensky, Vasily Kandinsky, Ernst Ludwig Kirchner, Mikhail Larionov, and Gabriele Münter, among others. Four more blocks south and we’re at the Metropolitan Museum of Art, where there are two blockbuster exhibits. 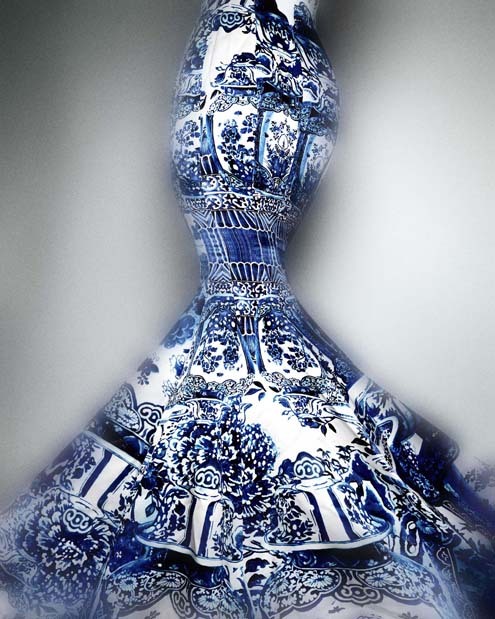 Then accelerate into China: Through the Looking Glass (through September 7), a knee-buckling exhibit that occupies parts of three floors of the museum and presents an almost hallucinogenic survey of Chinese-inspired fashion. This exhibition explores the impact of Chinese aesthetics on Western fashion and how China has fueled the fashionable imagination for centuries. In this collaboration between The Costume Institute and the Department of Asian Art, high fashion is juxtaposed with Chinese costumes, paintings, porcelains, and other art, including films, to reveal enchanting reflections of Chinese imagery. 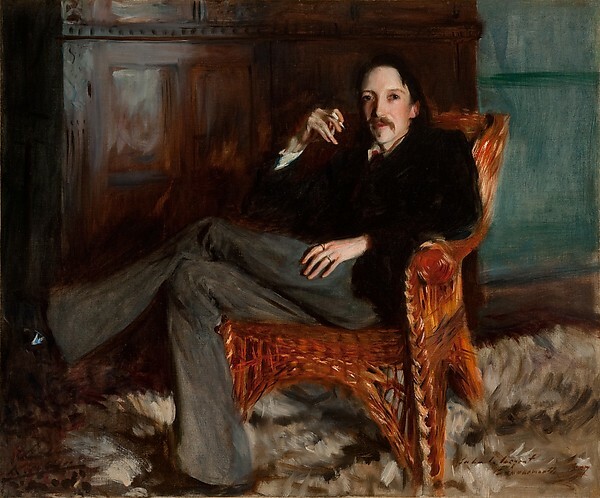 From the earliest period of European contact with China in the sixteenth century, the West has been enchanted with enigmatic objects and imagery from the East, providing inspiration for fashion designers from Paul Poiret to Yves Saint Laurent, whose fashions are infused at every turn with romance, nostalgia, and make-believe. Through the looking glass of fashion, designers conjoin disparate stylistic references into a pastiche of Chinese aesthetic and cultural traditions. 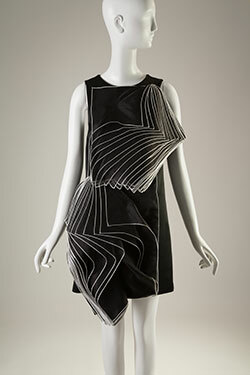 The exhibition features more than 140 examples of haute couture and avant-garde ready-to-wear alongside Chinese art. Filmic representations of China are incorporated throughout to reveal how our visions of China are framed by narratives that draw upon popular culture, and also to recognize the importance of cinema as a medium through which to understand the richness of Chinese history. You really gotta see it to believe it. On the way home we swung by the Bruce Museum in Greenwich to catch The Seven Deadly Sins: Pride, part of a seven-venue series of exhibitions mounted by the Fairfield/Westchester Museum Alliance (FWMA). 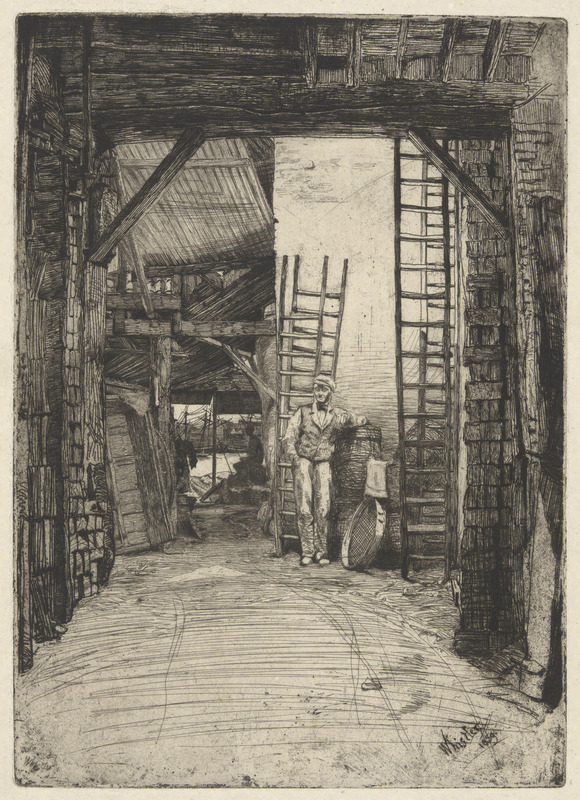 The engrossing exhibit is “[a] study of exquisite master prints, drawings, paintings, rare books, and a video installation [that demonstrates] the breadth and endurance of the imagery of this deadly sin,” and runs through October 18. 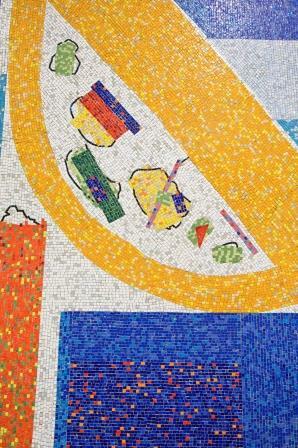 Although now nearly forgotten, Hofmann also created two huge public murals in Manhattan. In 1956, for the developer William Kaufman, and in collaboration with the noted pioneer modernist architect William Lescaze, Hofmann created an astonishing, brilliantly colored mosaic mural, wrapped around the elevator bank in the main entrance hall of the office building at 711 Third Avenue. Two years later, in 1958, commissioned by the New York City Board of Education, Hofmann created a 64-foot long and 11-foot tall mosaic-tile mural for the High School of Printing (now the High School of Graphic Arts Communication) on West 49th Street. 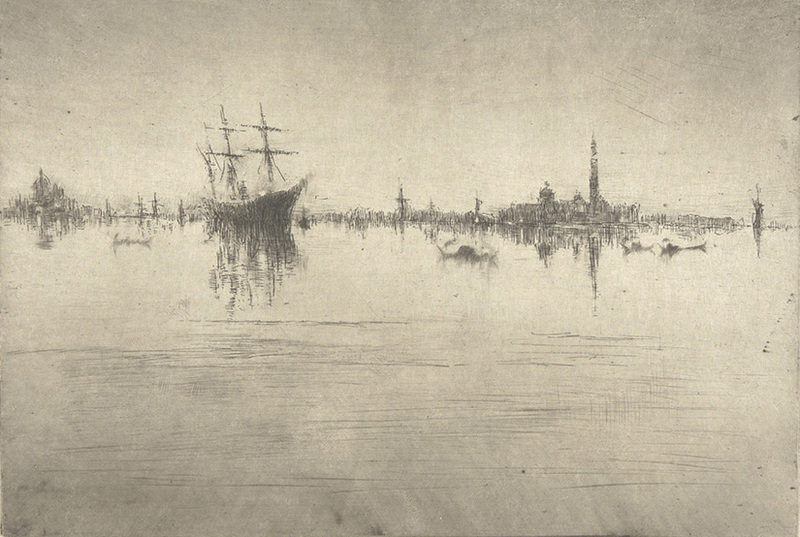 By coincidence, the curator of the Yale exhibit, Heather Nolin, gave a terrific lecture about Whistler and his etchings at Boston’s Museum of Fine Arts on Tuesday. But . . . that’s over as well. This entry was posted in Uncategorized and tagged ABC, Al Hirshfeld, Albert Maysles + David Maysles, Alexei von Jawlensky, All Or Nothing At All, America Is Hard to See, and Venice, Andy Warhol, Andy Warhol: Campbell's Soup Cans and Other Works 1953–1967, Arthur Dove, Bauhaus, Bing Crosby, Boston Museum of Fine Arts, Bruce Museum, China: Through the Looking Glass, Christopher Kane, Crosstown Traffic, Cut Piece, David Leopold, Douglas Carter Beane, Ella Fitzgerald, Erich Heckel, Ernie Kovacs, Ernst Ludwig Kirchner, Everything Is Design, Everything Is Design: The Work of Paul Rand, Fairfield/Westchester Museum Alliance, Fashion Institute of Technology, FIT, Folk City, Folk City: New York and the Folk Music Revival, Fractured Fairy Tales, Francis Seymour Haden, Frank Sinatra, Frank Sinatra Has a Cold, From Bauhaus to Buenos Aires, From Bauhaus to Buenos Aires: Grete Stern and Horacio Coppola, Gabriele Münter, Gay Talese, Gilbert and Lila Silverman Fluxus Collection Gift, Gilded New York, Global Fashion Capitals, Gothamist, Grete Stern, Gustav Klimt and Adele Bloch-Bauer: The Woman in Gold, HBO, Heather Nolin, Horacio Coppola, IBM, James Gardner, Jerry Saltz, Jewish Museum, Jimi Hendrix, John Singer Sargent, José Luis Sert, Joseph Pennell, Léonide Massine, Le Tricorne, Lincoln Center, London, Marcel Breuer, Metropolitan Museum of Art, Mikhail Larionov, MOMA, Mortimer Menpes, Museum of Modern Art, Museum of the City of New York, Natalia Goncharova, Neue Galerie, New York magazine, New York Public Library for the Performing Arts, New-York Historical Society, NeXT, One Club Creative Hall of Fame, Pablo Picasso, Patti LuPone, Paul Rand, Revolution of the Eye: Modern Art and the Birth of American Television, Ringo Starr, Robert Louis Stevenson, Rorschach test, Russian Modernism: Cross-Currents of German and Russian Art 1907-1917, Sargent: Portraits of Artists & Friends, Saving Place: 50 Years of New York City Landmarks, Saving Places, Sergei Diaghilev, Shows Every Day, Shows For Days, Sinatra: An American Icon, Stettheimer Dollhouse, Steve Jobs, The Hirschfeld Century: The Art of Al Hirschfeld, The Seven Deadly Sins: Pride, The Weekly Standard, Tiffany & Co., UPS, Vasily Kandinsky, W. Graham Robertson, Walls of Color: The Murals of Hans Hofmann, Whistler in Paris, Whitney Museum of American Art, Yale University Art Gallery, Yoko Ono, Yoko Ono: One Woman Show 1960-1971. Bookmark the permalink. Glad it was “swell”–and who is your trip planner/logisitics organizer? He or she did an outstanding job! That would be the Missus, Bill, and yes – I definitely married up. How many weeks did it take to view all of those exhibits? Great reviews. Sorry that I will miss them.